Sorry for having made you wait for so long! It has been over six weeks that we have updated you and we hope that this will not happen again! We have a whole series of events taking place the last weeks, so better make sure you have some time. We continue our trip from Guatemala, where we had a very good first experience of central America together with Belize. Leaving Guatemala you have to options: either you go through El Salvador after which you go a bit through Honduras to go to Nicaragua or you go through Honduras after which you go through Nicaragua. In the days before leaving Guatemala we talked to several travellers to see what they would do and we realized that most people have preference to skip Honduras as it is considered to be to dangerous. We on the other hand thought it would be ok to go, based on Alex' sister Annelies who had been there before. So we head into Honduras a bit curious to see if it is as people describe it to be and we can luckily say that it was not that bad (this is maybe our personal view as we have had some time to adapt to Central America). Our first stop in Honduras is Copan Ruinas, nearby the boarder. This tiny village is an excellent base to go visit the similarly named ruins of Copan which are absolutely spectacular. The main structures are vast and the detailing is impressive. On top they are having a large group of Aras/guacamayas flying around the entrance which are truly beautiful and rare to see in the wild! After sleeping at a local balneario we continue towards the Caribbean in the hope to see some nice beaches. One of the places would be a the National Park of Jeanette Kauwa where there would some nice jungle with some remote beaches. Unfortunately we ended up in a big storm on the way there and we couldn't make it into the park - not even with The General (the official name of the vehicle, but more on this later). So we decided to continue towards La Ceiba where there is a boat towards the island of Utila, known for being one of the cheapest places on the earth to dive. Having found a safe place to leave to car for some days we head to the port of La Ceiba to realize that there hasn't been a ferry in three or four days due to the weather. We couldn't really understand how it is possible that a ferry doesn't go out with a bit of storm and so we were optimistic that we could soon take a boat. And indeed, the next day we could leave in the afternoon and we immediately understood why the ferry didn't go out in the last days - after departure the waves we`re very high for the small ferry and half of the people on the boat were looking down with a plastic bag in there hands. 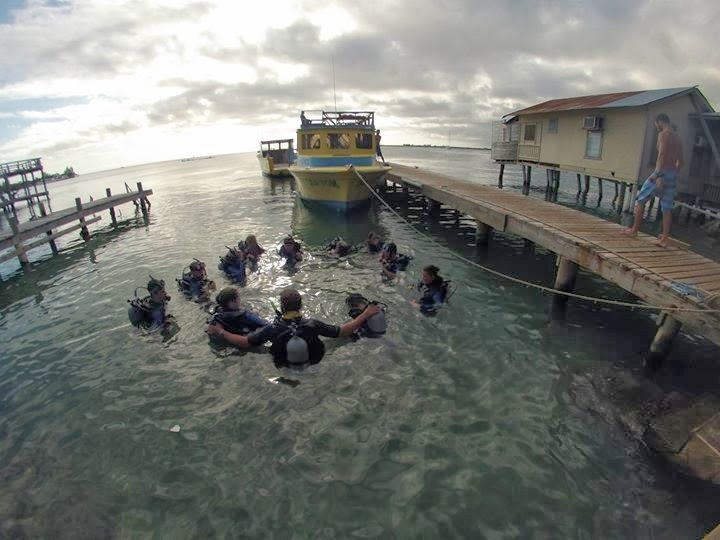 On the island we decide to have our open water diving classes at the Utila Dive Center. 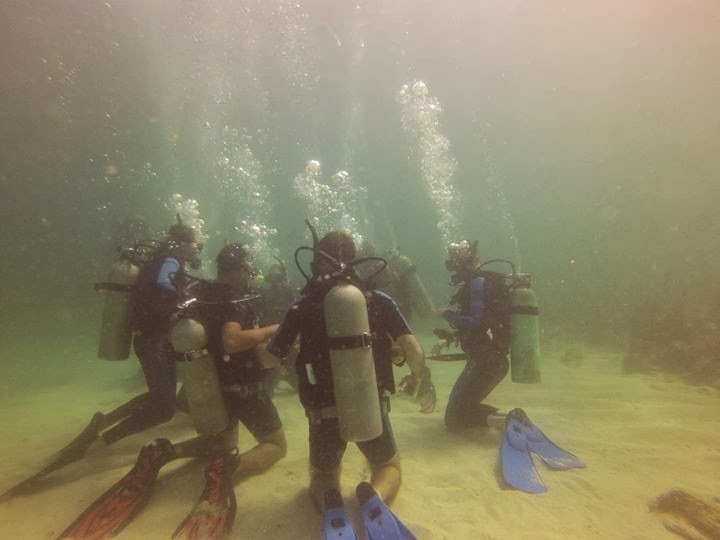 The course costs 300$ a person for a 4 days of training and accommodation and allows you to dive until 18 meters on your own. The island of Utila cannot really be considered to be part of Honduras in the sense that it is very touristy and it has relatively good facilities. For us it was great to be here to experience another type of travelling. Here we find ourselves more in a backpackers atmosphere with plenty of people around us and lots of places to go to eat and drink. The combination of the relaxed atmosphere and the excellent classes at the UDC (our diving center) made us decide to stay a bit longer and to follow an additional diving course (Advanced Open Water) which allows us to dive until 30 meters and which focusses more on some specific skills (like buoyancy control/navigation...). After ten days on the island we have had a great introduction into diving, we met tonnes of cool people (Linn, Sharon, Erika, Mark, Chris, Lindsay, Vero, Edmun, Katerina... ) and we had a lot of fun but we started to be worried about the car, so we felt like going back. Luckily, the car was totally fine and we could continue our trip - which felt a bit strange after being on an island for so long. Next stop is Lago Yojoa, a very nice lake which is mainly known for the birdlife. We stay here for a couple of nights at a local beer brewery, which was a great place to do some excursions around the lake and the coffee farms in the area. From here we go to the village of Comayagua to go towards a National Park Celaque . The road towards the park is definitely a challenge: the ground is slippery mud and often we pass washed away parts. But the views are simply amazing as the steep hills in the surrounding are filled with coffee plantations. After a couple of hours driving - and getting stuck in the mud in a dead end road - we arrive at the national park a bit disappointed. In Honduras a National Park doesn't necessarily mean that the area has lots of things to see, it actually means that the area is a protected zone divided into areas where people can live, an area where people can have limited infrastructure and an area where no infrastructure is allowed. Still, we found a nice short trail towards a waterfall which made us see the cloud forest together with our optimist guide. The best part of being here is that we camped at a coffee farmer which was so incredible nice. He gave us an introduction into the production of coffee and we could buy coffe from them. Finally good coffe!! We leave the park via another road which was more accessible and head towards the Nicaraguan boarder, crossing the capital Tegucigalpa and sleeping in the nearby beautiful town of Santa Lucia, where we can enjoy some beautiful views of the mountains and Tegucigalpa on the background. The next day we are ready to cross into Nicaragua. It is amazing to cross the boarders in Central America, as every country has there own defining landscapes. We leave the rainy hills of Honduras behind us and enter the amazing plains of Nicaragua, characterized by occasional tall volcanoes. We decided to stay on the Pacific side of Nicaragua, as there is much to see and as we are in a 'hurry'. We only wanted to spend six weeks in Central America and want to cross to Columbia at the end of January. On our first day we explore the northern peninsula, where there are some spectacular mangrove forests which we have not visited as we didn't find them. From here we headed down towards the city of Leon, a beautiful colonial town which has some severe scars from several earthquakes. Here we meet our first Belgians who are travelling with their for children from the USA till Panama in 6 months in their own camper. It was funny to park in a random street to find a camper slightly in front of you to realize after that they are from Belgium. We camp a night with them nearby the Leon university after which they proceed quickly to spend a maximum of time in Costa Rica. We stay in Leon to visit the city more and mostly to see our friend Sharon, which we had met in Utila. Sharon normally travels by backpack so we suggested to here to join us in The General - this is how they call this car in Guatemala as generals in the army drive with them and we all decided this name was appropriate for our car. So the four of us continue to visit Nicaragua with the next stop being Managua. Here there is little to see apart from the old cathedral. This cathedral was entirely made in concrete and has been mostly destroyed in an earthquake but has a certain charm - The Lonely Planet describes this church as a church without a heart in a city without a centre, which we found to be very appropriate. From Managua we go to the nearby volcano of Masaya, where you can camp for the night. Here we were joined by the security guide as he was a bit bored and as he was afraid of snakes. The volcano itself can be accessed by car and you can park right next to the crater, you just need to make sure that you park backwards so you can race away if there would be an explosion. You do not see much of the crater as it is continuously smoking, but it is nonetheless very impressive. From here we go to the city of Granada, another beautiful colonial city in a better condition as Leon. Here we can camp at the fire station, which mostly acts as a private (and ugly) parking. A quick visit to the city and we are off to the island of Ometepe, which is a very spectacular island in Lago Nicaragua consisting of two volcanoes. We buy our tickets for the ferry and have some time left to go to eat and do some shopping for on the island. Returning to the car after shopping we are shocked: they had just broke into our car by forcing the lock and stole our camera, our laptop as well as a bag from Sharon and most importantly our hard drive with all our pictures on it. All travel pictures from all of us are gone. There goes our plan to pass Nicaragua fast - we only left three weeks after when we have made a declaration in front of the judge. A long story short: We were obviously shocked of having been robbed - please note that this is something that can happen everywhere and that we do not want to say that either Nicaragua or Central America is unsafe! - and required some time to regain the confidence to travel again. Still, none of us three are quitters and we had two things that other tourists which are robbed often do not have: Time and a Spanish speaker. Most of the thefts happen to tourists and they simply do not have the time to go through the long process and even if they would, nobody speaks English. So anyhow, in our last three weeks in Nicaragua we have assisted the police in their research by collecting evidence, reaching out to embassies and doing some basic searching for the thieves ( Nicaragua is small on this side and everybody drives over the same road, so it cannot be hard to find someone). The result at this stage is that we do not have any of our stuff back, and we have little hope to get anything back - but that two of the three thieves are already in prison. We can only hope that the police can get some further information from them on our stuff and that we might get our pictures back. Nonetheless, we are happy to have contributed this much time to this case as the previous combination of police laziness and tourist inability to talk make it very difficult to have cases like this reported. We can only hope that the time invested in this case will reduce the number of thefts in Nicaragua. So obviously this was our lowest point on our travel and luckily we were the three of us together to handle the situation. Nonetheless, we have continued to visit Nicaragua in the meantime! Finally we did manage to go to the island of Ometepe, which is a very cool and relaxing place. We have also had sufficient time to check out some more beached at the pacific, including the surfer town of San Juan del Sur and the gorgeous beaches of Playa majada and Playa Madera. In the last we had the excellent experience to camp on the beach for a couple of days together with overlanders Steve, Gilly and there two adorable kids Alishia and Lucy; with the dutchies Michel and Erika and with UK team John and Betty . After these nice days on the beach they all proceed towards Costa Rica while we still stay a couple of days to continue with the case. Going to Managua a couple of times to get some paperwork and Sharon's temporary passport arranged we are ready to proceed our trip, hoping that one day they'll find our pictures but being realistic and having accepted that chances are almost non-existent. After almost 4 weeks together we have to say goodbye to Sharon, who goes back to Managua and we want to cross to Costa Rica. We have spend many good times together both on Utila and in Nicaragua. Unfortunately life had a surprise for us here and we are happy to have attacked the situation together, sometimes with a smile and sometimes with frustration and disbelieve. At the end we should maybe just be happy that we are okay and that this bad experience allowed us to have a great time being undercover police detectives. It was a good decision, as our car permit was gonna expire the next day! 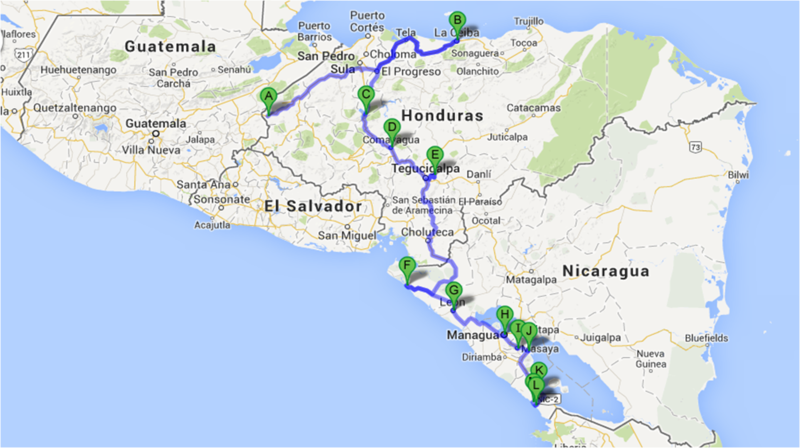 With a ten day delay we can finally ship the car to Ometepe! Thanks, we have indeed continued our trip after those three weeks of investigation! It was hard to leave it behind but we have no other choice but to accept it! Nice pictures, hope you have the trip of your life ! Hi Kev, thanks! Hope you are doing fine! So far, apart from the last incident, we cannot really complain: Life is pretty sweet for us right now! Yeah, we still had a bit of hope - which now is lost completely, but more on that in our next blog! As they stole the camera we were kind of dependent of the iphone for taking some pictures and it has this panoramic picture taking ability - more of those will follow! Bravo!!! Felicitats als dos!! Estic molt content que estigueu bé!! Quina passada de viatge!! I quina enveja!!! Tenim ganes que torneu ben aviat!!! Good luck!!! hola marc! m'alegro que us agradi!! :) tenim ganes de veure-us!! ohhh q xulu! Quina ràbia això del robatori, pero lo important és que esteu bé! Molts petons!!!! teia! si, va ser un cop dur, però estem bè que es ho important!!! Sorry to hear about the theft, but we're glad to see you keep on going. Hope to see you again down the road. When do you plan to jump the gap? Thanks for your sympaty! We are reaching out to the shipping companies as we write and hope to be shipping rather soon ( within ten days, but this is of course dependent of them). Hope we can speed up on the Southern part to see you guys there! Hola Mireia! !fa 5 dies que vareu marxar...va ser un plaer coneixeos,m'ho vaig passar molt be,espero que ho tingueu tot apunt per creuar a panama i que hagiu trovat algu per compartir container...aqui estem be,pero els apats i les nits de sobretaula ja no son el mateix sense vosaltres...us deuen xiular les orelles,doncs us tenim molt presents!! Amb l'Angela et recordem amb afecte i alegria,sense treuret protagonisme eh...jejeje!! Us anire seguint en el vostre marevellos viatge i espero veureus per llafranc quan tingueu uns dies despres de que hagiu arribat i acomodat!! Pura vida guapissims i gracies pels bons moments!! Hola Rosa! Quina il.lusió el missatge! Nosaltres ens enrecordem moltisssim de vosaltres, encara us tenim present a les nostres converses! El día que vam marxar ens vam arrepentir directament, ens hauriem d´haver quedat més dies! En quant torni em tindreu directa a llafranc! Et desitjo el millor a Costa Rica o on decideixis quedar-te! Plis diguem el teu e-mail aixi podem mantenir el contacte! Una abracada ben forta! Plis mai em treguis el protagonisme! dona un petó ben fort al Francesc i a l´Àngela!